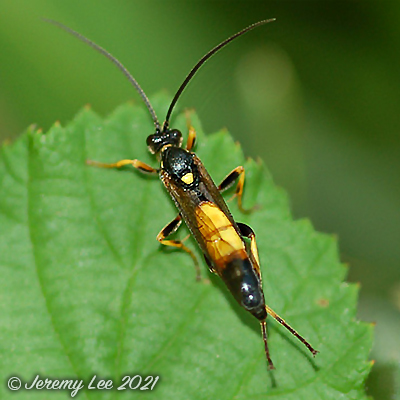 Amblyteles armatorius is one of the larger and more attractively marked ichneumonidae, approximately 15mm in length, excluding antennae. A parasitic wasp, it does not possess a sting, and is therefore harmless to humans. The strong yellow and black markings most likely make it a Batesian mimic; a form of protective mimicry in which an unprotected species closely resembles an unpalatable or harmful species and therefore is similarly avoided by predators. Very often found in summer on flowers feeding on pollen, especially umbellifers such as Hogweed. Found almost everywhere in lowland Britain on roadside verges, hedgerows, woodland rides and clearings, especially on any dense undergrowth such as bramble patches.